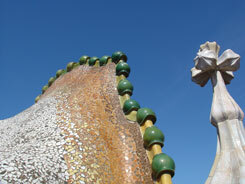 The profile of Barcelona follows the hypnotic rhythm of Antoni Gaudís art. Considered one of the greatest figures of world architecture, Gaudi is distinguished by a unique and distinctive style. Born in June 25th 1852, he is the greatest exponent of Catalan modernism, and has inspired generations to come, being the forerunner of many artistic avant-gardes of the early twentieth century. Gaudi and Barcelona cannot be separated from each other: you are involved anywhere in the city by his traditional lines and figures, a wedding between urban and natural forms. Gaudi’s attention was constantly drawn to the organic world, inexhaustible inspiration for his works.Besides Park Guell and Sagrada Familia, his most representative works in Barcelona Casa Mila, which is also known as La Pedrera and Casa Batlló. Both of these building are located on the precious Passeig de Gracia, the most expensive street in Barcelona. Walking up from Plaza Catalunya the first Gaudi building you reach is Casa Batlló. Casa Batlló, which is now owned by the Bernat family, the former owners of the Chupa Chups company, was built in 1877 and in the years 1904 to 1906 restored and remodeled by Antoni Gaudí and Josep Maria Jujol. The locals call this building “Casa dels ossos” (House of Bones), as the columns at the bottom look a lot like bones, some of the balcony have a structure which reminds of rips and others look like the area of the eyes on a skull. The facade itself glitters in various colors – from golden to greenish blue, all small mosaic tiles that look like fish scales. Typical for Gaudi, straight lines are avoided whenever possible. The colorful roof reminds of the skin of a reptile and it is said to represent the story of Saint George (patron saint of Barcelona) and the dragon. A small turret up there with a cross on it symbolizes the sword of St. George killing the dragon. The bones and skulls on the façade are used to represent the victims of the dragon. Also the staircase in the inside looks like the spine of a big animal. The exterior of Casa Batllo is already very impressing, but also the interior is breath taking. You barely find straight lines, everything is round, natural forms and it is conspicuous that Gaudi paid attention to every single detai: the wodden floors, the beautiful windows, the walls and ceiling and even the ventilation system reminds of the gills of a fish. 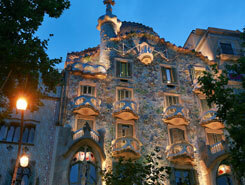 In the inside there is also a museum with furniture, which Gaudi designed, and a souvenir shop. On the roof top terrace you will find beautiful chimney stacks, decorated with mosaic tiles and of course a great view over Barcelona. Metro: L2 (purple line), L3 (green line) or L4 (yellow line) to “Passeig de Gracia"